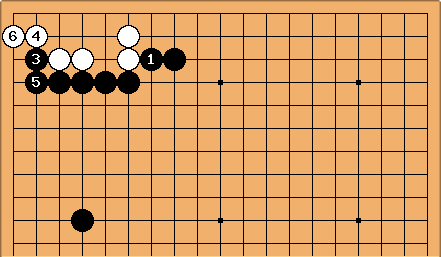 Carrying on some comments at thickness example 1, an alternative in joseki for Black gives this position. 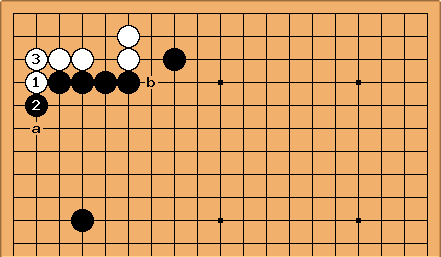 Black plays the marked stone, rather than at a. This variation seems to have been out of style just recently. It makes for an interesting discussion, though, in that it appears to be a thicker play. 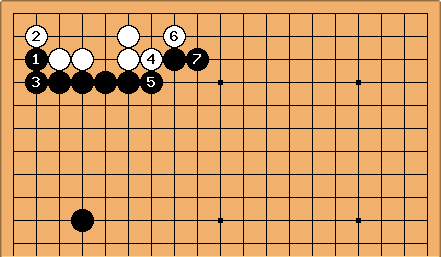 Black 1 is a tight move. If White ignores it, Black 3 and 5 are then sente against the corner. 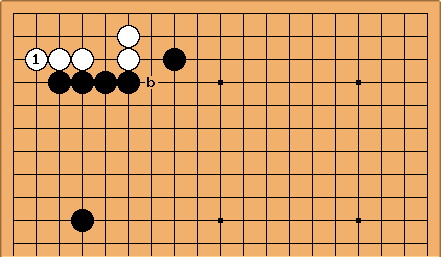 While White can play 4 and 6 for eye shape, Black isn't so likely to start at 1 here. Of course Black will become thick, in gote though. Judging by pro play, White's interest here is in playing 1 and 3, leaving behind weaknesses at a and b. Cutting first at b seems to be a rare play at pro level. This is really another joseki (usually reached by a different move order), rather than a follow-up play; and deserves its own discussion (thickness example 5). Black probably now takes sente, and White's later cut at b becomes much more interesting, because White 1 creates an open skirt just where Black's wall might need eye space in a fight.